Waylon Jennings lyrics are intended for your personal use only. Use these classic country lyrics with chords to help you learn to play and sing this great music every chance you get, keep it alive. Waylon Jennings was born and raised in a small town in Texas learning to play the guitar by the time he was eight. He formed his first band at the age of twelve and spent a lot of time at the local radio station. He spent much of his youth in the cotton fields and eventually moved to Lubbock and got a job at a radio station and there he met and became a close friend of Buddy Holly his mentor. He eventually produced Waylon's first single and let him play bass in his band. With the untimely death of Buddy Holly in a plane crash it took several years for Waylon to gain his momentum. 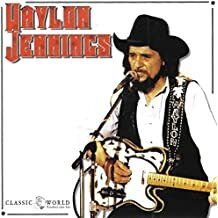 Eventually he landed a recording contract with RCA with the help of Bobby Bare and moved to Nashville becoming one of the most significant country forces of the 70's. He enjoyed much success throughout his career and left us with many great songs.